Your online ads are working, but does anyone believe it? Once someone clicks on an online ad and visits your website what did they do next? ¬†Did they immediately leave, visit multiple pages, or fill out a form? You need to make sure that your web tracking software can accurately identify traffic from your online ads. If you haven’t done so already, pop on over to Google Analytics and follow the steps to setting up your account. When people visit your website what is it that you want them to do? If you’re with a B2B company you may be looking for new leads. Maybe they have to fill out a form to download a white paper, or to get a product demo. Maybe your run an ecommerce site and the goal is for them to make an online transaction. Its possible that you may have several goals that a visitor could potentially achieve depending on where they are in the sales cycle.¬† It is crucial for your organization to clearly identify what you want your visitors to do. This is also your first opportunity to get other involved in the project. Make sure you cover all of the obvious goals and then ask key team members if there are others goals that are important on the site. Once your team has identified all of the website goals, you need to set values for each of them. It is important that the same people you will be trying to convince with your reports are involved in this process. They need to agree with the methods used to determine the values of each goal and believe in the final values. As an online marketer, goal valuations should be one of the most important metrics that you use. They should be well documented,understood, reevaluated regularly, and believed by everyone in your department. Once you have goal values that your organization believes in, the rest is easy! With Impressions, CPC, CTR, RPC, Bounce rates, and a bunch of other possible metrics, it is easy to get bogged down in data. Each one of these metrics might be important to you when you are trying to determine a specific aspect of a campaign, but it’s information overload for anyone else trying to read your reports. Stick with basic metrics that will show how the ads are performing and include a glossary that explains the purpose of each metric. Impressions: The number of times your ads were displayed. This can also be seen as a branding opportunity. How many times did you ad appear in a clients browser? Clicks: The number of clicks on your ad. 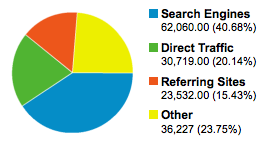 CTR: Clickthrough rate is the percentage of impressions that resulted in a click. This will tell you how well your ad was received by the total audience. Conv.1 %: The percentage of Visits that resulted in a Goal1 conversion. Cost: The cost of your online ad. CostPerConv. : Costs / Goal1 Conv. I like to display my reports in this order because it matches the progression prospects actually follow when experiencing the campaign. They first see the ad (Impressions), they click on the ad (Clicks and CTR), they reach one of your conversion pages (Goal1 Conv., Conv.1 %, Conv.1 Value). Following this kind of logic makes it easy for the rest of your team to understand your reports. Online advertising can be the fastest most cost effective way to market your products or services. It can also be the fastest, most visible way to burn through company resources, so it is important that your company understands and believes in your online ad reports. Instead of being seen as a drain on company resources, your online ad campaigns will be seen as the valuable, income-producing powerhouses they are! What kind of struggles have you had when convincing others in your company of the value of your online campaigns?